It’s Eagles-Giants week, Fire The Walrus Nation! To celebrate the nationally-televised Sunday Night affair – and to honor our favorite rivalry not involving those assclowns from Texas – we’re running back one of our favorite features here at FTW… Reasons to Fire The Walrus. And this one has a Giant twist. 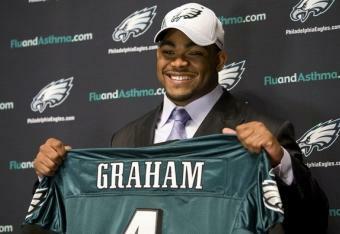 The 2010 NFL Draft was not a particularly good one for the Philadelphia Eagles(*). Highlighted by “The Donovon McNabb Pick”(**), which turned out to be Nate Allen, and 7th-rounder Kurt Coleman (who’s a nice player at best), The Walrus swung and missed on nearly all of his 13 picks, most notably first-round pick Brandon Graham. Sure, the team found its current Safety tandem, but Mike Kafka is no longer here, Riley Cooper has done absolutely nothing and Clay Harbor is, at most, a backup. (*)Hmmmm, what were the odds of that?! (**)The second-round pick the Eagles received from the Redskins for McNabb. The Eagles sent the 24th overall pick and two third-round picks to the 49ers in order to move up to the 13th spot and take Defensive End Graham out of Michigan. With 29.5 sacks, 8 forced fumbles and 56 tackles for loss over the course of four seasons, Graham had a fairly productive collegiate career; but at 6-1 263, he was, and is, clearly undersized to play DE at the pro level. Andy fell in love with Graham’s intelligence and “high motor,” but neither of those characteristics have translated onto the field. In fact, none of Graham’s traits have translated to the field, as he hasn’t seen much playing time in his three year career. Whether due to injuries – and there have been a few(***) – or poor performance, Graham has only appeared in 19 games over three seasons, and those appearances haven’t amounted to much. For his career, Graham has posted a total of 3.5 sacks and 2 forced fumbles to his credit. (***)Is it any surprise that Graham is currently questionable for Sunday’s game? While the Eagles traded up to grab Graham, they also did so to prevent the New York Giants from taking the top DE on their board, as NY was hellbent on adding a pass rusher in 2010. Two picks after the Eagles traded up, the Giants happily let Jason Pierre-Paul fall into their laps. Unanimously described as a raw talent with tremendous upside, but a longterm project, JPP was one of the biggest mysteries of the draft. Experts had him projected all over their mocks, from the top-ten to the bottom of the first. And of course, a team that is known for pumping out All-Pro Defensive Linemen, snatched him up. In 35 games, the 6-5 270 JPP – a physical specimen and the prototype for a Defensive End’s body – has 22.5 sacks, a Pro Bowl appearance, All-Pro honors and has looked absolutely dominate at times. He’s leapfrogged D-Line stalwarts Justin Tuck and Osi Umenyiora to become the Giants’ premiere pass rusher and signature Defensive player. And these were things we expected when the Giants drafted him. Now, there’s no way of knowing if JPP would have developed so quickly in Philadelphia and blossomed into the terrifying threat that he has become? In fact, as history has proven, Pierre-Paul likely would have sustained a freak injury his rookie year and eventually faded out of the picture like every other DE that Reid has drafted high(****). Graham, Victor Abiamiri, Jerome McDougle, Derrick Burgess… Andy spent one of his first three picks on all of them (sometimes more, as he traded up to get Graham and McDougle), and they all flamed out quickly. And that doesn’t include two second-round picks on Trevor Laws (a pass rushing DT) and Daniel T’eo-Nesheim (another DE Andy tried at LB), and a third-rounder on Chris Gocong (a hybrid DE-LB that the team tried at OLB), none of which panned out. (****)Remember, Trent Cole, who was a 5th-round pick. But regardless of The Walrus’ propensity to draft undersized, “high motor,” hybrid-type pass rushers, Graham over JPP was a phenomenal mistake. While Graham is still trying to find his footing with the Eagles, JPP is quickly becoming one of the most feared Defensive players in the league, with the potential to be an all-time great. The Eagles gave away two third-round picks to take a guy who can barely see the field, while their biggest rival stood pat and got exponentially better (and, oh yeah, went on to win another freaking Super Bowl, courtesy of their dominating Defense). Good work, Andy! Just another in a long line of reasons to Fire The Walrus. This entry was posted on Friday, September 28th, 2012 at 1:54 pm and is filed under Reasons to Fire The Walrus, The Walrus. You can follow any responses to this entry through the RSS 2.0 feed. You can leave a response, or trackback from your own site.